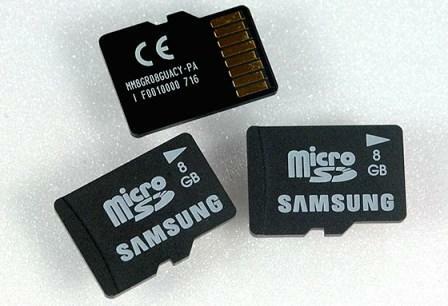 The South Korea consumer electronic giant, Samsung has announced that it has developed a new 8GB microSD memory card which is a quarter the size of SD (Secure Digital) card for mobile phones recently. This 8GB fingernail-sized MicroSD card can store up to 2,000 MP3 files, 4,000 digital photos or around five DVD-quality movies. Besides, the MicroSD memory card can be used in an extender for use in full-size SD slots which widely used in electronic devices to allow multimedia files downloaded by multimedia mobile phones to be easily displayed on other media. With a high data transfer speed of 16MB/second for reads and 6MB/second for writes, Samsung’s 8GB microSD card well exceeds the Speed Class 4 SDHC (Secure Digital High Capacity) standard, according to Samsung. Anyway, the company claims that its 8GB MicroSD card will not go into mass production until mid of 2008.